No milk and cereal for me for breakfast. 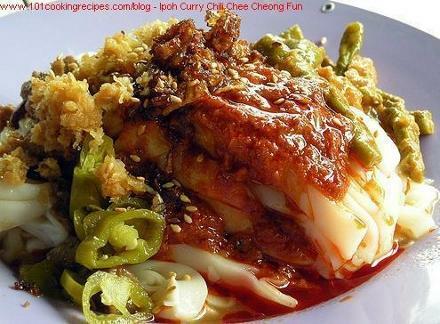 As children, my brother and I woke up to packs of Ipoh Chee Cheong Fun that my dad bought at the morning market. It was always a delight to slurp on strings of flat rice noodles, all covered in thick mushroom sauce, mixed with sweet chilli sauce to wake up the tastebuds in the mornings. Garnished with pickled green chillies, sesame and some drops of sesame oil, we'd lick our plates clean before we start our day. Even now as I am writing this, I can smell the comforting aroma of the sesame oil in the noodles ! Loved it then, and still loving it now, but can't afford it as much, as it heads straight to the hip these days. Naturally I spent every dime I got on all things sweet as a kid. The Ais Kacang, as it is fondly known in the North, was a great thirst-quenching, energy boosting experience for me during my sunny bicycle rides in the hilly neighbourhood when we lived in Jelapang, Ipoh. I loved the ones served at a little hut, underneath a huge tree (coming from Jalan Tokong), near a bus stop. 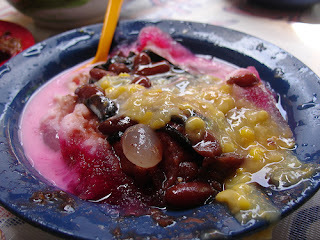 A mountain of shaved ice, piled over a mixture of peanuts, colourful jellies, creamed corn, shredded nutmeg and red beans, sweetened by both condensed and evaporated milk with some rose syrup, it was divine. I loved every taste and texture as I sipped and cycled. I always asked for the bright, red (rose) syrup instead of the unexciting brown sugar option. These days, it is commonly known as Air Batu Campur (ABC), and it is topped with ice-cream. I don't get it. A bit over-the-top for me. Due to a health condition as a kid, our family doctor advised my parents not to feed me mutton or lamb. So everytime my dad cooked the red meat I so loved, I was given only a tiny piece to satisfy a huge craving. Sometimes I begged, sometimes I stole when he wasn't looking. Dad only cooked the Mutton Curry when there were visitors or parties. Made using fresh and dried herbs, and, exotic spices grinded manually using a traditional Indian flat grinding stone, I remember the steam and smell, bursting out of the pot everytime dad removed its lid to give the curry a good stir after a boiling point. This went on till I was about 11. 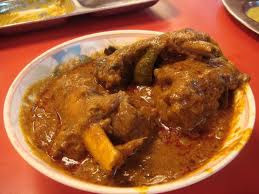 I miss the curry, but I no longer like lamb and mutton as I used to. Maybe it was sweet then because it was forbidden. If you could call it a vice, then it was a my only as I stepped up into teenhood. 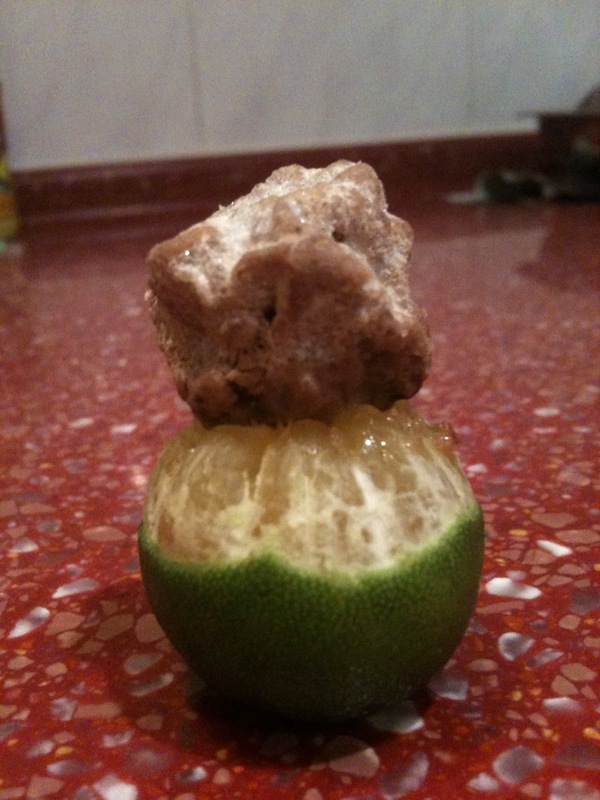 I've always loved the citrusy burst of a lime. It tingles and teases my senses, it's almost sensous :D Thanks to my mom, I was 12 when she half peeled a lime, exposing only the top, to stuff a preserved plum into it. I ate it by holding the bottom, and sucking on the top. When the tang of lime and salty-sweetness of plum bits became one on the palate, it clicked and climaxed into a new burst of appetizing flavours. I was hooked on to it. I ate it ALL the time it was an addiction. Whenever and wherever. I still do. I also discovered baking during my teens, and to bake the perfect Moist Chocolate Cake was a personal mission. I'd wanted to bake the most delicious of chocolate cakes, so when I saw a recipe book with a photograph of a dark cake with gleaming chocolate sauce on it, I bought it. Baking was a weekend hobby then. At first try, my chocolate cake turned out looking nasty and crumbly, but it tasted great. So I baked more, and even sold it during a fundraising event at school. It was sold out. At home, everyone was happy to see the emerging baker in little Jaya, and they ate with glee whatever I baked. 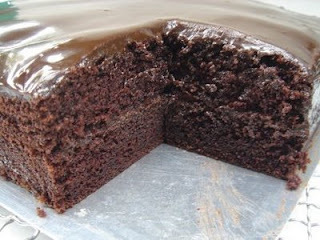 But the Moist Chocolate Cake is still a hit, never mind if I'd gotten the recipe from a recipe book! The first one. Mushroom and sweet chilli sauce on flat noodles sounds unbeatable. Not sure about the green chillies though - weren't they a bit too hot for the morning? The green chillies are not the hot sort, GB. They're cut n pickled in local vinegar. So it has the sharp zing of vinegar n a slighty sweet aftertaste. It's a common garnish for many Chinese hawker food here.